What can you expect from this walk? 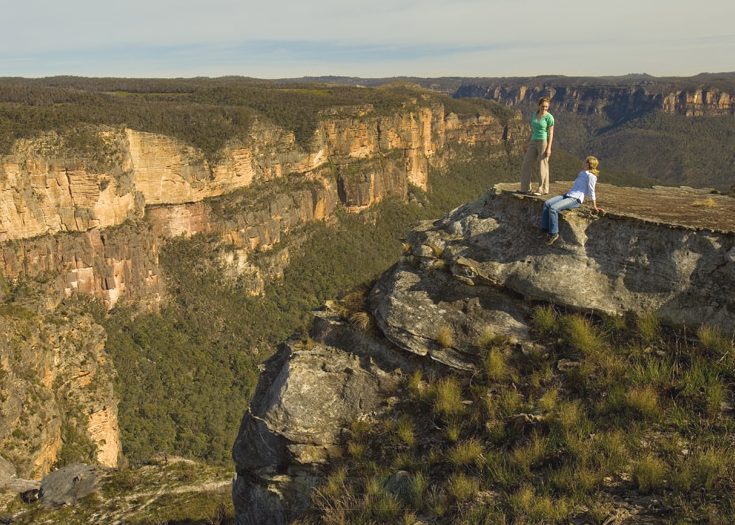 Auswalk’s Blue Mountains Traverse is a privately guided or self guided inn to inn accommodated walking holiday. You walk through the National Park from one delightful accommodation to the next. We move your luggage for you while you are out walking. Trips can start any day of the year for a minimum of two people booking together (or for solo travellers for an additional fee). On this holiday, both the self guided and guided itineraries cover a similar walking route, but of course you’ll have the benefit of an excellent Auswalk guide on the guided trip. Our guides are usually locals, and know the mountains like the back of their hand. Some of your highlights will be a descent of the Giant Stairway and a close brush with one of the 3 sisters. Ruined Castle and Grand Canyon are much less busy walks, but even more likely to have you gasping with amazement. 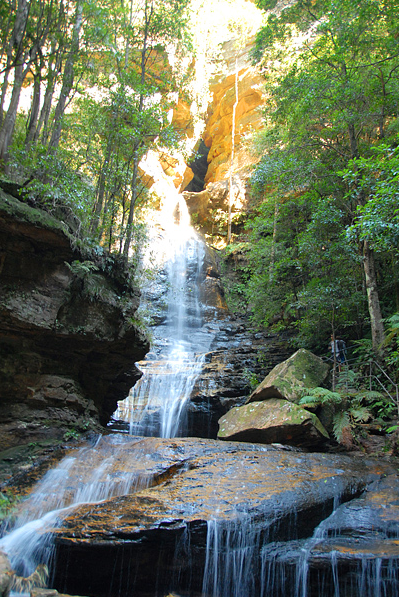 Rainforest and water are common themes in Blue Mountains, and one of the most remarkable descents has three waterfalls all meeting close together on the walking track before shooting off to crash further down the mountain. Water in Bridal Veil Falls goes so far in a single drop, that it seems to disappear before the bottom. Creeping vines, green moss and big trees will be your constant companion, and there is a high chance of seeing a Lyrebird! 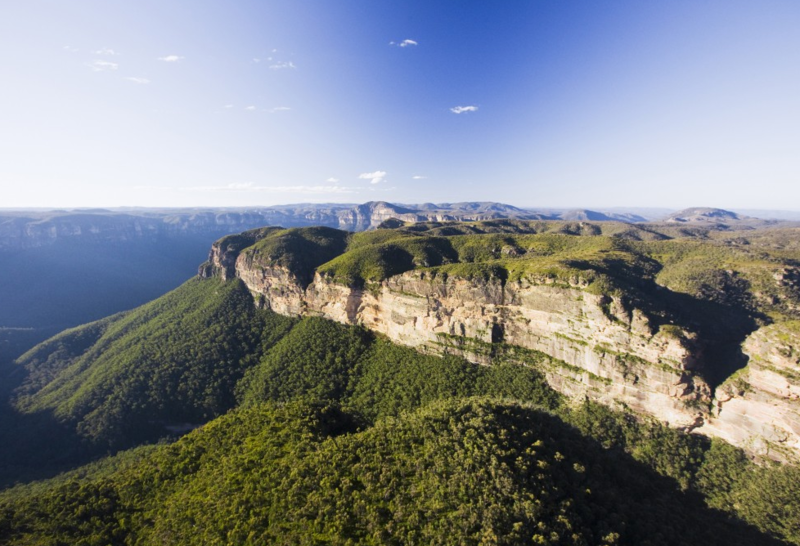 With good reason, Blue Mountains is our longest running trip and is always popular. Note that if this trip is available as a 5 or 7 day itinerary and as both a privately guided or self guided option (see the details below). 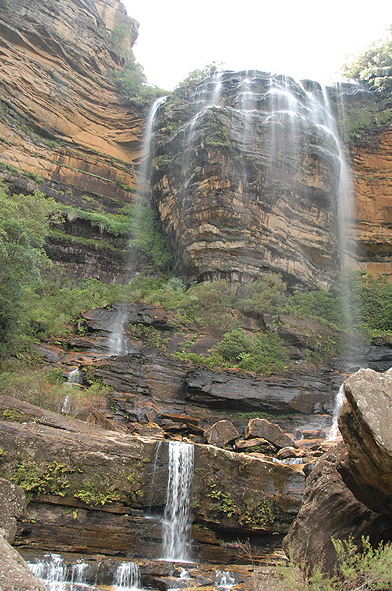 If you have even less time our 3 day privately guided Blue Mountains Weekender trip is for you. 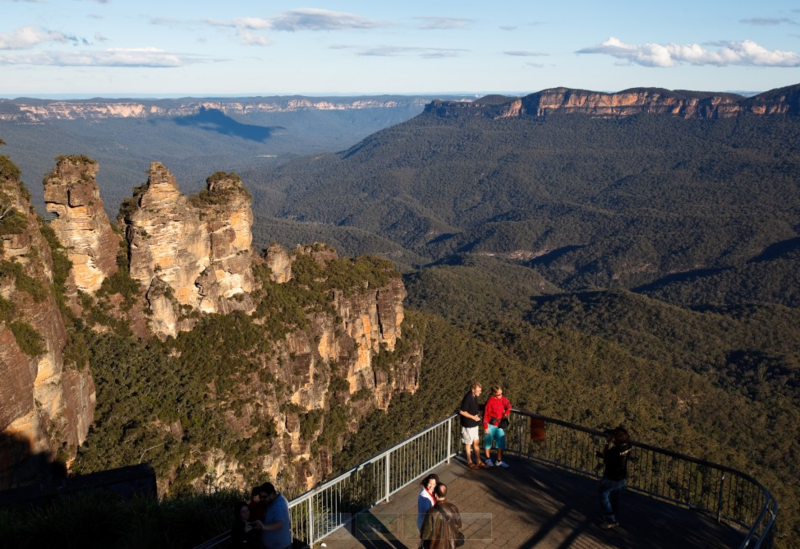 The Blue Mountains is about 2 hours west of Sydney, easily accessible by local train or car. We can also arrange private transfers from Sydney airport or city hotels. B&Bs and historic guesthouse – private rooms with ensuite bathrooms. 7 day itinerary: One guide (for guided trips only), 6 nights accommodation, 6 breakfasts, 5 lunches, 4 dinners, luggage transfers, vehicle transfers required for the itinerary, Scenicworld pass including Scenic Railway ride & Sceniscender gondola ride, National Park fees, insulated lunch bag, maps, map case & info pack. 5 day itinerary: One guide (for guided trips only), 4 nights accommodation, 4 breakfasts, 3 lunches, 3 dinners, luggage transfers, vehicle transfers required for the itinerary, world pass including Scenic Railway ride & Sceniscender gondola ride, National Park fees, insulated lunch bag, maps, map case & info pack. Available all year except July. October-November is usually mild to warm. Temperatures warm up from December-February. March-April is usually cool to mild. Temperatures drop from May onwards and the days are cool to cold. July brings occasional snowfalls. Warmer, spring weather returns around September. The Blue Mountains is noted for its international cuisine with restaurants attracting some of the best chefs in the country. Accompany with award winning wines from the nearby Hunter Valley winery district. Day 1: Starts at Mt Victoria for the 7 day itinerary or Blackheath for the 5 day, any time after 2pm. There is no walking scheduled for today but there are several galleries and coffee shops in the village to explore. Contact our Travel Specialists for more details. They can be reached at 604-736-7447 or by sending us a message through our website via the 'contact us' button!